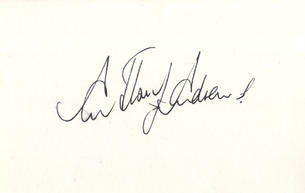 This is a Hand Signed White Card 5.5" x 3.5" by the English Actor. Anthony Andrews born 12 January 1948 in London) is a British actor. Andrews grew up in the North Finchley district of London. At the age of eight he undertook dancing lessons, making his stage debut as the White Rabbit in a stage adaptation of Lewis Carol's Alice in Wonderland. After a series of short term "fill-in" jobs that included catering, farming and journalism, he secured a position at the Chichester Theatre where he worked as an assistant stage manager and later as a stand-in producer. He auditioned in 1968 for a production of Alan Bennett's new play, Forty Years On, which featured John Gielgud as the headmaster of a British public school during the First World War period. Andrews was cast as Skinner, one of twenty school boys: the role gave him the opportunity at an early age of working with Gielgud. His subsequent work includes a leading role in Brideshead Revisited as Sebastian Flyte. In 1982, he won a Golden Globe and BAFTA TV Award for his performance, and was nominated for an Emmy Award. In the United States, Andrews is known for his portrayal of Ivanhoe as well as that of Sir Percy Blakeney in the 1982 film, The Scarlet Pimpernel. He was the main star of the ITV television series Danger UXB, in which Andrews plays a British bomb disposal officer in World War II during the London Blitz. The series first aired in the United States in 1979 on Masterpiece Theatre. He played Professor Higgins in a stage version of My Fair Lady (2001) and Count Fosco in Andrew Lloyd Webber's The Woman in White.